In advance – Apologies for the horrible pictures! Bad lighting and el cheapo camera! My usual camera is having a tantrum. 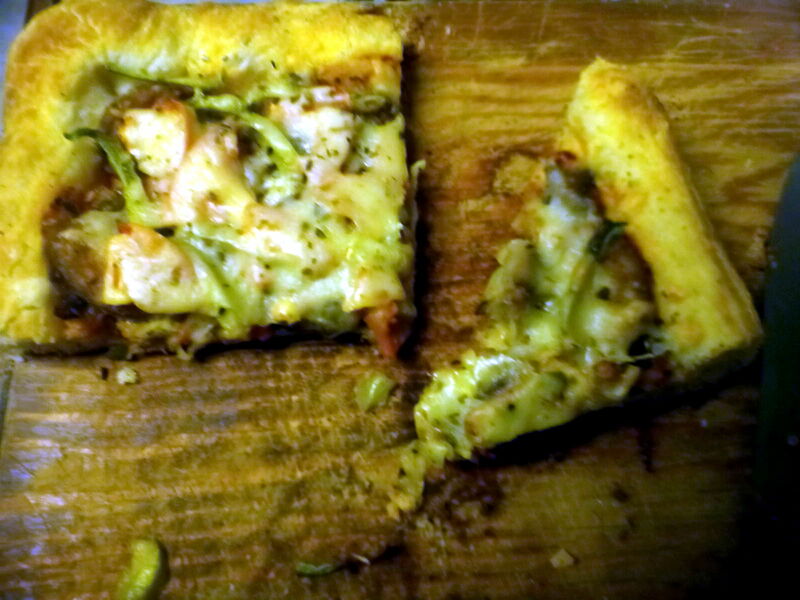 With that aside – I made some pizzas the other night that were probably the best pizza I’ve ever had! I used the French Bread recipe for a crust but I added pepper, oregano, rosemary and basil to the dough. After the 3rd stretch & fold of the dough, I divided enough to make a large pizza on a baking sheet, and used the rest to make 4 personal sized pizzas. This worked out because there were 4 of us for dinner! If you plan ahead, make this dough a day or 2 ahead of time and let it bulk ferment in the fridge, the flavors change a lot during a cold ferment. After dividing, I shaped them and gently used my fingers to dimple to crust up to the edges, let them proof, brushed the tops with oil, and pre-cooked on the bottom rack at 500F for 5 minutes to prevent any sogginess from the toppings. The baking sheets were first oiled to help the bottom of the crust get crispy. 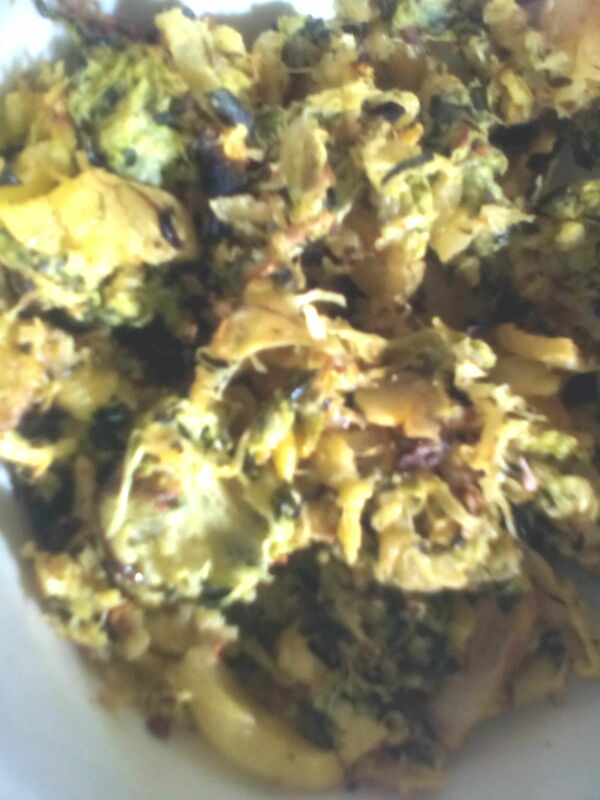 I had shredded zucchini and spaghetti squash in the freezer from last years’ harvest. 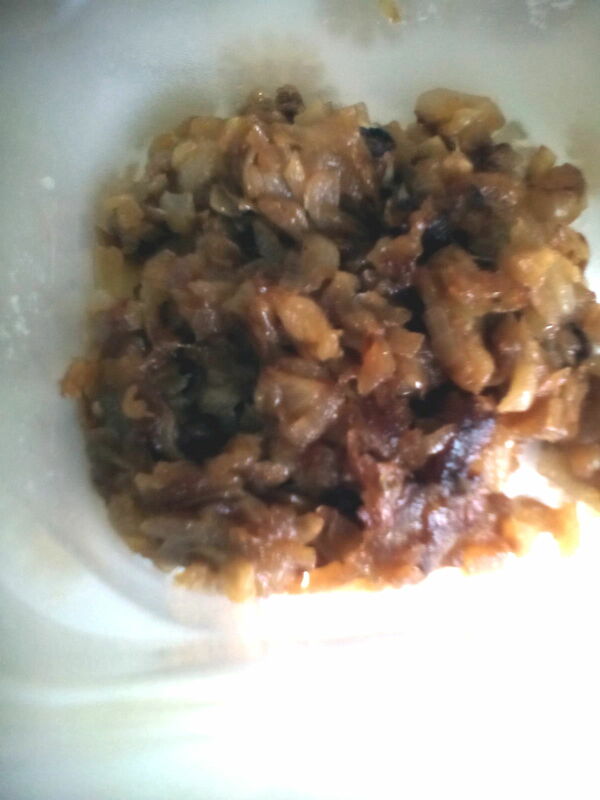 I defrosted it in the nuker and left it to drain in a strainer over a bowl while I caramelized 2 yellow onions. Once the zucchini and squash had drained, I squeezed out the excess water. I roughly chopped 2 cloves of garlic. All of this was mixed together with a drizzle of oil, salt, pepper, chili flakes, oregano, basil and rosemary. I spread it out on a baking sheet and put it under the broiler for 10 minutes – mixing occasionally – to bring out the flavors. 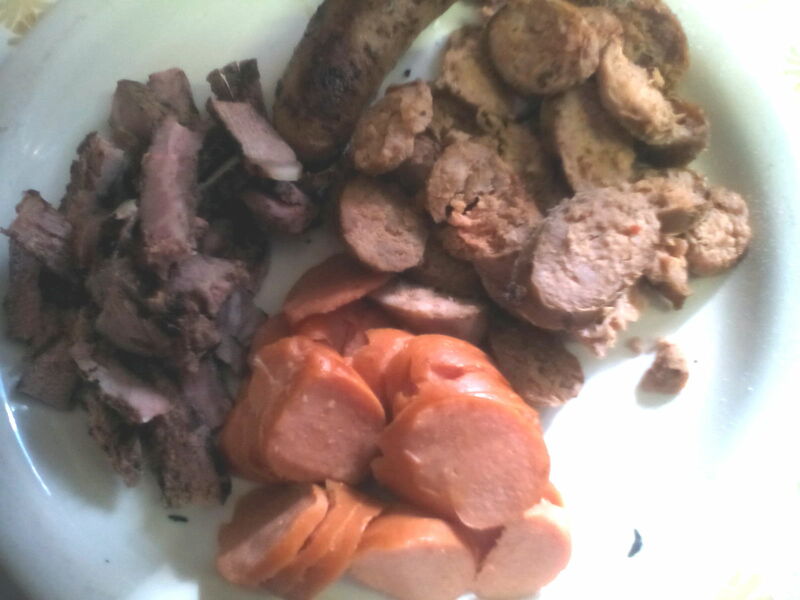 I fried 3 italian sausages, 1 knackwurst, and about 4 oz. of steak and sliced them up. 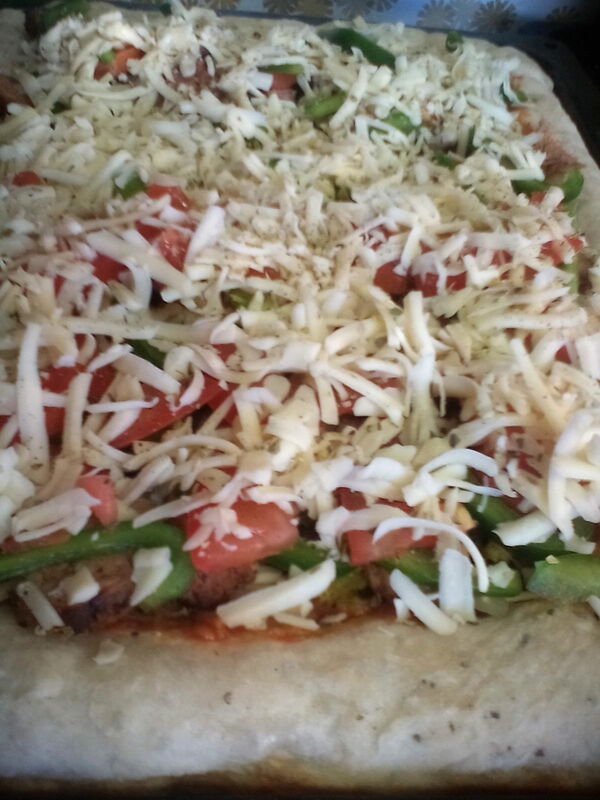 Everything was left to cool while I sliced up more onion, green pepper and tomato, and grated some mozzarella. Once everything was cooked, cooled and chopped accordingly, I moved on to assembly while preheating the oven to 475F. The oven should preheat at least 1/2 an hour. I used 3 parts pizza sauce:1 part ceasar salad dressing to coat the crust. The personal sized pizzas were baked first. If making 2 pizzas, do them consecutively, NOT on different racks in oven. I used oiled metal sheets as that is what I have to work with. So I used the bottom rack of the oven. The 4 smaller pizzas took 10 minutes. The large pizza took 13 minutes. Watch carefully while baking anything on the bottom rack;) After all that work, I watched extra closely!! The prepared pizzas could also be placed on a sturdy sheet of cardboard and wrapped in plastic and frozen until needed. 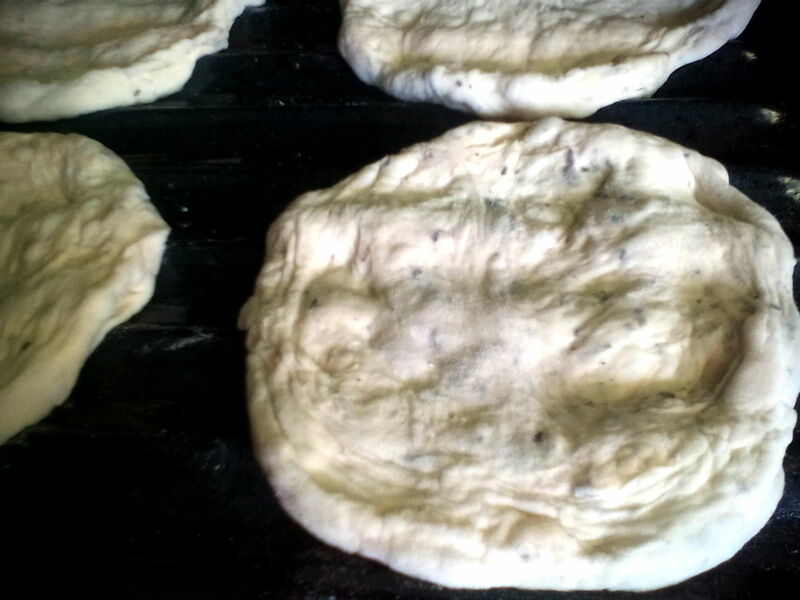 If the sheet was oiled, and the crust pre-cooked, you should be able to slide them straight onto the cardboard. Serve with a green salad and you won’t be disappointed. 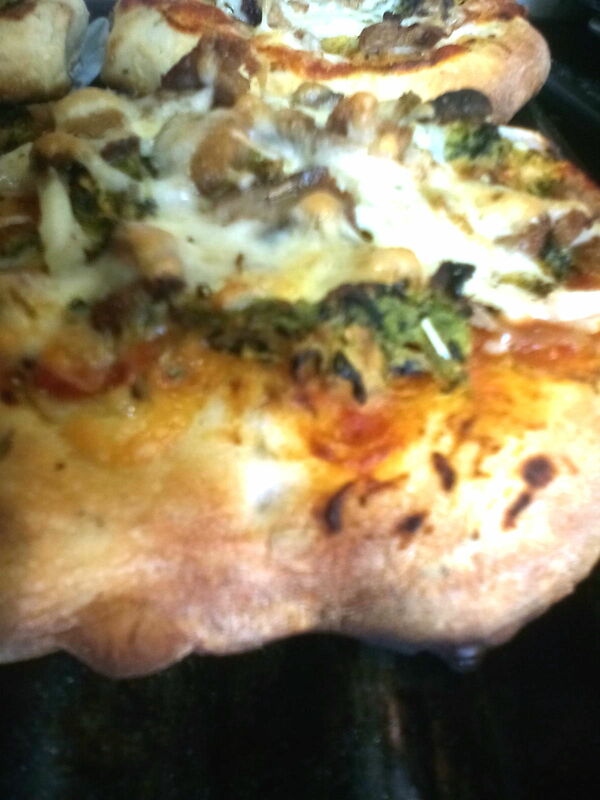 The crust had just the right amount of crispiness, and you can’t beat the look of artisan pizza! It was a fair amount of work, but they were so good I know I’ll make them again! Yesterday as chance would have it, I came across an ad for a free Craftsy class by Peter Reinhart on making pizzas at home. I watched all the videos before deciding to share them. You can watch video, take notes, ask questions, and browse course materials. 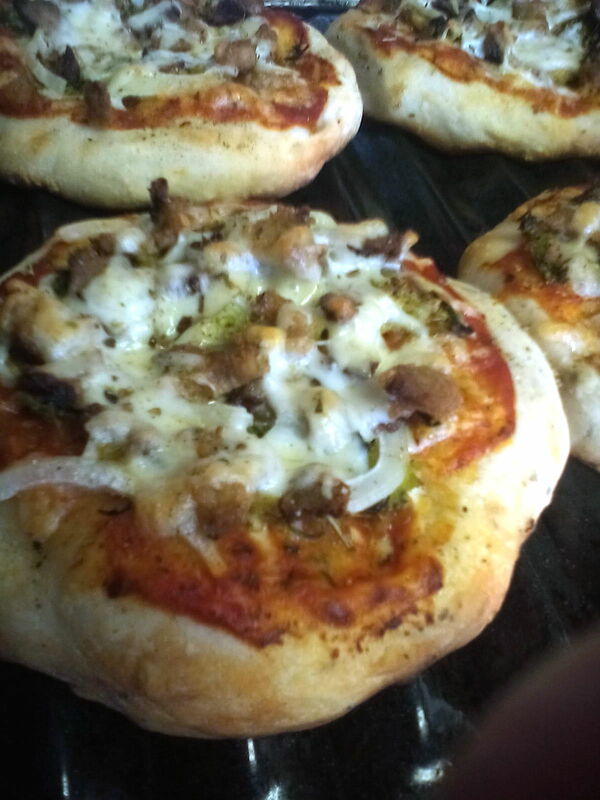 If you’re nervous about trying out pizza making, this is definitely worth checking out!! Affiliate Disclosure: I was not financially compensated for this endorsement, all opinions are based on personal experience. I receive a small percentage from Craftsy if you join and/or make a purchase. This does not affect cost to you and helps pay for hosting this site. This looks and sounds really good ! I don’t normally go for any but the norm in pizza but I might have to try this. Thank you for sharing ! This looks super yummy! I would love to try making this. We have pizza every Friday night as we watch our favorite shows…it seems that that is the only time we can all get together. However, we never make them..we buy. Yours looks better (and I think you are being too hard on yourself about the photo) than most we experiment with. I shall do my darndest to get us making it one of these nights. thank you! This looks like a pizza I would really enjoy! This looks really good. May have to try this recipe. 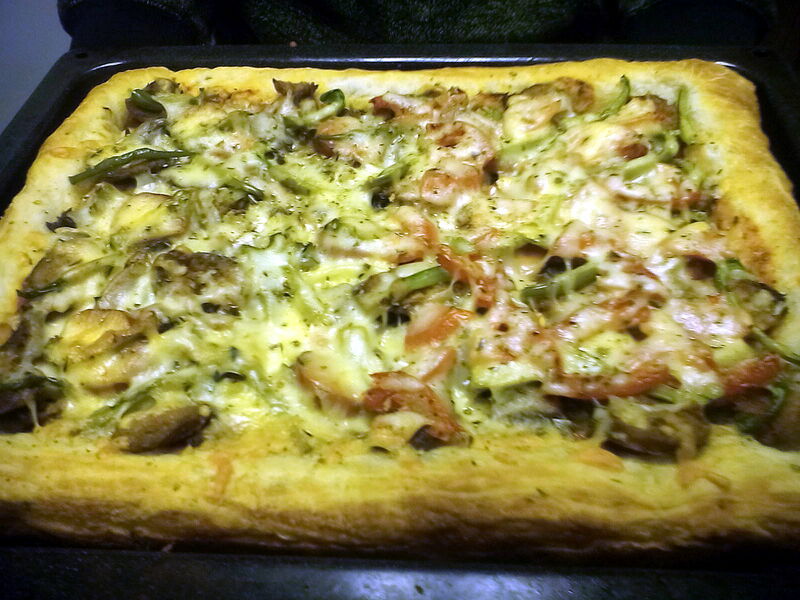 I love pizza night in our home, everyone gets so hands on with creating the pizzas, this pizza above looks so delish! Wow I haven’t tried any pizza like this but I would love to. Yum!! Looks superb! I could use this brilliant recipe for my weekend party! Thanks for sharing. yummmy! i love pizza! thanks for sharing this! Even though I make bread alot I have never tried this type. Your recipe looks so appetizing I will have to get a move on and try this bread recipe. This dough recipe is my go-to for pizza now, everyone loved it. Let me know if you try it out! Love fresh baked pizza. This dough sounds amazing. I will keep it, and after the holidays, we will be having pizza, home made is always best. OMG!Yum, I have to make this one :) Thank you! This looks so much better than any pizza I have made. I may just have to make this; it looks so yummy. Mouth-watering pizza! Thanks very much! This sounds really good. I’ve never made pizza at home. Maybe I’ll give this a shot. Thanks! This sounds and looks so good. I will have to try this. We love making our own pizzas at home. This sounds very good and looks good. I will have to try this since we love making our own pizza at home.